﻿ Brooklyn College | Announcing Our New M.F.A. Degrees in Media Scoring and Sonic Arts! Announcing Our New M.F.A. Degrees in Media Scoring and Sonic Arts! 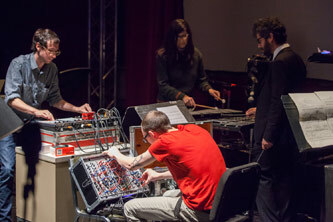 The Matthew Gantt Group performs at the International Electroacoustic Music Festival. The Conservatory of Music is pleased to announce the introduction of two exciting new graduate degree programs in Media Scoring, which coincides with the opening of the new Barry R. Feirstein Graduate School of Cinema at Brooklyn College, and Sonic Arts, the latter to enhance our already rich program at the Center for Computer Music. We will debut the two new M.F.A. degrees in fall 2016, adding to the current B.Mus. and M.Mus. degrees in composition and the Ph.D. in composition (via the CUNY Graduate Center). The two new degrees balance flexibility and artistic freedom with practical skills for employment. Courses will be held at the new Barry R. Feirstein Graduate School of Cinema at Brooklyn College, located at the Steiner Studios, a 15-acre fully professional, Hollywood-style media production lot. The curriculum includes cinema, composition, conducting, technology and music business. The curriculum is a flexible/customizable menu of courses. The program is open to students with a bachelor's degree in music or in another subject. Please click here for more detailed information.